There are wonderful possibilities in lighting. Every indication of modelling on the face is due to light and shade, and if you think of light as something which is shed across the form of the face, it will help you to see the tones in a simpler broader sense. 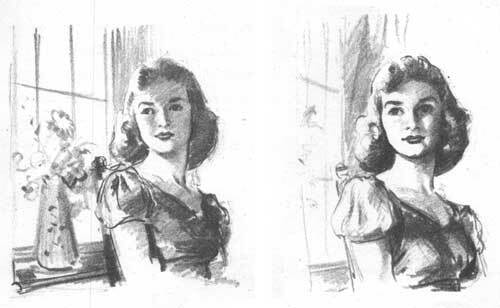 Too many tones in a portrait tend to make your drawing seem fussy. Try to differentiate between colour and tone. Of course, colours have their tone values, but often, if for instance you were to look through a smoked glass at two colours, say a pink and a pale blue you might be surprised to find that the pink was the darker in tone. If you half close your eyes you can usually decide. Sometimes one sees very intriguing reflected lights on the shaded side of a head. I would advise always to half-close the eyes, and these lights are thus immediately subdued into their proper place. Shading along and round the form, that is down the side of the nose for example and round the cheeks, is a dangerous practice for this reason; we find we are relying on directional lines to indicate the modelling. Also we are tempted to draw lines round eyelids, round nostrils and along hair, etc. Now what appears to be a line round the eye is often the dark edge of a tone on the fleshy part above the eye coming suddenly against in the light on the upper lid. Sometimes the shadow fold of flesh will look like a line, but usually it is a tone in a crevice coming against a light. If you shade across the form in one direction, you will avoid these mistakes, also you will be able to think of hair as being a solid mass instead of a lot of separate lines. Posing the model beside a window affords a good deal of scope for lighting experiments. 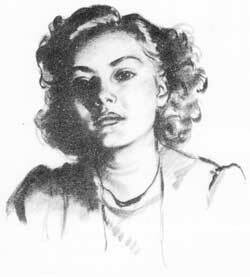 By turning her head this way or that you may throw some delightful patterns of light on the face and dress, etc. If you have too strong a light your darks will become too dense to enable you to discern the essential details, so that, except in special cases where a dramatic effect is desired, strong sunlight from a window should be avoided. When, however, you do feel the urge to produce a dramatic portrait you might try lighting from underneath or above, but do not spoil the effect by too many lights. Brevity is not only the soul of wit, but also in some cases of art too. For the sketch above I drew the curtains behind my model and used an electric lamp to light the head, leaving enough light from the window for my own purposes.